Sometimes little defects in teeth can attract more than their fair share of attention. The eye often seems drawn to the tiny chip in a front tooth; the slight mismatch in tooth size among adjacent teeth; the extra-pointy canine. If you find yourself staring at these subtle yet distracting features in your own smile, we can help — often with a minimally invasive, relatively inexpensive procedure known as tooth contouring (reshaping). 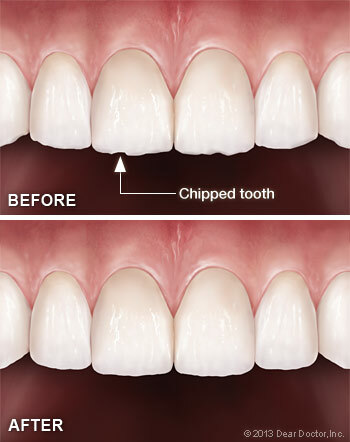 Cosmetic problems that can be corrected with tooth contouring include: small chips, uneven tooth length, slight overlaps, and tooth edges that are too flattened or pointy. It can even be used to correct minor bite problems from teeth touching unevenly during contact. Conversely, we would not reshape your teeth if any bite imbalances could result from it. Rather, we would recommend one of several other highly effective cosmetic dental procedures. Tooth contouring can also be used to give teeth a more feminine or masculine shape, simply by rounding or squaring the edges. The first step in the contouring procedure is to examine your teeth and diagnose how the reshaping will accomplish your goal of smile enhancement or correct a bite problem if you have one. This will enable us to ensure that the teeth being reshaped will not only look better but also will be healthy. Sometimes a reshaping of the root surfaces is required to protect you from gum disease. In that case, an x-ray may be necessary to isolate and protect the sensitive inner tissue (the pulp). However, most often tooth contouring only involves the removal of a bit of enamel — the hard outer covering of the tooth. Because enamel is not living and contains no nerves, you will likely not need even a local anesthetic. You will probably feel some vibration as we gently sculpt your tooth or teeth, and then polish them smooth. Reshaping one tooth usually takes less than half an hour — and the results will be obvious as soon as you look in the mirror! Sometimes reshaped teeth can be a little sensitive to hot or cold after the procedure, but this should last no more than a day or two. Tooth contouring can be combined with whitening for a dramatically younger-looking smile. It's also often used in conjunction with cosmetic bonding or dental veneers — both of which can be used to reshape teeth with larger imperfections. We would be happy to have a detailed discussion with you about the cosmetic dental treatments that would best achieve your desired results.